Pet Insurance: Helpful or Hassle? A pet insurance company is apologizing to a Marina del Rey dog owner after her battle over a claim led to frustration and insults. Kathryn Larsen paid for a policy with 24Petwatch, which made her responsible for a $100 copay and the full cost of treatment, 70 percent of which was to be reimbursed if the claim was approved. But when she submitted a claim for her rescue dog, Oliver, after he underwent testing and treatment for a hormonal deficiency, she hit a brick wall. "Two months later, I hadn't gotten a penny," she told I-Team consumer investigator Randy Mac. "It's been painstaking." Larsen started emailing the insurance company, 24Petwatch, with questions about her reimbursement, only to be given answers she found unsatisfying. At one point, she was even the target of ridicule. "I got an email that said I was a snot," she said. 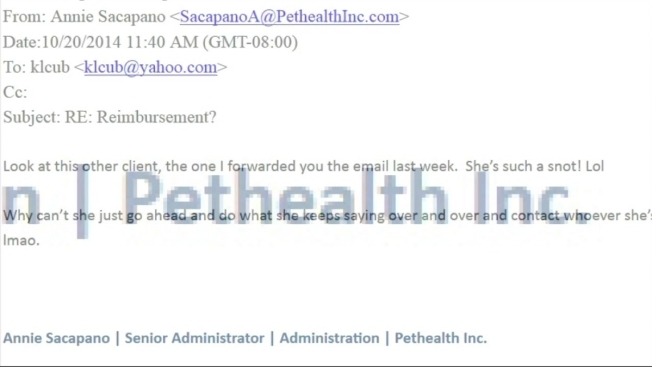 The email was from a senior administrator with 24Petwatch's parent company, Pethealth, Inc. The email continued, "Why can't she just go ahead and do what she keeps saying over and over. Geez, just get it done and over with, LMAO." Wes Kazdan, the director of customer care for Pethealth Inc. told the I-Team that the employee who wrote the email has been spoken to, and that as a company "we're incredibly embarrassed and certainly don't want people to think that's how we think of our customers. It's disappointing, poor judgment by one employee in our group." Company officials also admit Larsen's claim -- and hundreds of others -- have been delayed by staffing and technology issues over the summer. The problems are now fixed. Longtime Los Angeles area veterinarian Dr. Jeff Werber has seen his clients struggle with pet insurance companies before. "When it comes to filing claims, there are problems. There's no doubt about it," Werber said. "Let's face it, the insurance companies are in the business to make money, not lose money." But Werber adds he still recommends some form of insurance, even if it means funding an interest-bearing account in a pet's name. The best part about that plan, he says, is that if your pet makes it through life without any medical emergencies, at the end of the day, "that's your money to keep." Along with the apology from 24Petwatch, Larsen has received the reimbursement she was due for Oliver's treatment. But the unpleasant experience, especially the insulting email exchange, may have cost the company a customer. "It just made me shake," she said. "I was upset. I was angry. I felt taken advantage of. You're the customer! I'm the customer!"